If you’ve been matched betting for any length of time you are likely to have come across the term ‘gubbed’. This guide will teach you all you need to know about account gubbings. Matched betting does have many peculiar terms and acronyms. You can check them all out in our Matched Betting Glossary. To receive a gubbing from a bookmaker (or to be gubbed) simply means that they no longer allow you to receive the majority of promotions that they advertise on their site. In most instances, a bookmaker will send you an email letting you know this. Bookmakers will also limit stakes of profitable punters, but in matched betting terms being gubbed relates to promotions. Bookmakers are all in the business of making money for their shareholders. The corporate bookmaking model in Australia is based on high margins and promotions. Bookmakers offer large incentives for a punter to sign up with them. Bookie sign-ups that are widely available can range from $50 - $1000. At certain times of year such as large horse racing meetings like the Spring Carnival bookies have in the past been known to offer bonuses in excess of $2500 for you to join them. They also offer regular promotions on various events to get you to redeposit or bet with them further. They do this as to make a profit, they need you to keep betting and depositing as much funds as possible. Bookmakers make money as they have a built-in margin on the bets taken. This margin ranges from just a few percent up to 30% or even 40% on some markets. If we were to assume a bookie was offering odds of 1.90 for both teams to win in a game of AFL then that would have a 10% margin. If they managed to take bets of $100,000 on each team then on that game alone the bookie would make $10,000, regardless of the result. Now, of course, bookies can’t get an equal book on every market, but with the odds heavily stacked in their favour, it is simply a case of getting punters to bet more for them to profit more. Deposit bonuses and ongoing promotions are a great way for bookies to get people to add to the funds in their account. They know that on average as long as someone keeps betting with them on markets that they have a margin in eventually the money will all end up in their pockets. A punter may win on individual bets but if they are betting into a market with a 10% margin then it would only take them 10 bets of $100 to lose on average $100 to the bookie. The bookmakers whose only goal is profit don’t like this. If they identify that you are a punter who has an edge over them, then they will take away your access to their promotions. This is the way the Australian Corporate Bookmakers work. They limit or ban any punter who they suspect has an edge over them. Anyone who dares to eat in to their substantial profits. What they are left with is a group of mug punters who they are happy to take bets and profits from day after day. All the corporate bookmakers in Australia will limit winners and gub punters gaining an advantage through promotions. The truth is they don’t like winners. Have a look at these emails. You can expect to receive several in your lifetime as a matched bettor. There are a couple of exceptions. Betfair is a betting exchange. It is based on peer to peer betting. Punters can back and lay bets against each other. Betfair makes its profit from taking a small commission on the net profit a punter makes in a market. Because Betfair makes a profit regardless of who wins they have no reason to limit winning punters. Pinnacle is a traditional bookmaker who does not limit winning punters. They are able to create an efficient enough market with enough volume to utilise sharp punters to help them shape their odds and still create a profitable book. 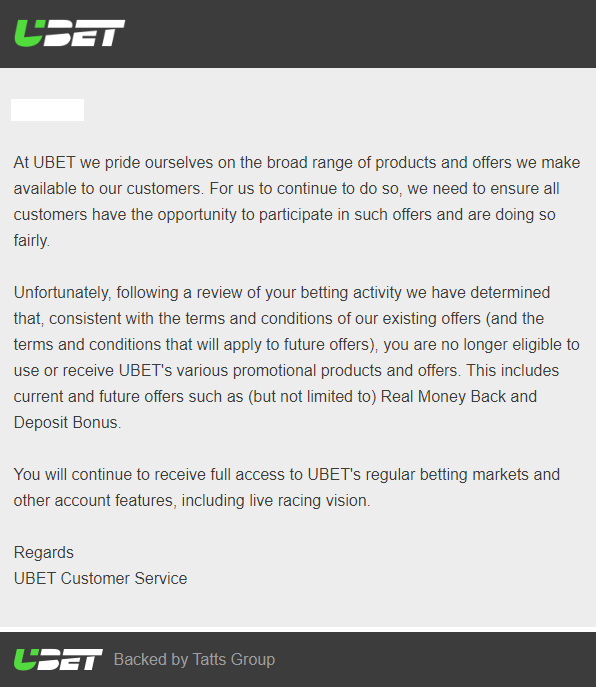 Unfortunately, thanks to laws created to restrict overseas betting Australians are no longer able to bet at Pinnacle. How do Bookmakers know who to gub? Bookmakers employ traders and risk teams. Part of their roles are to ensure that unprofitable customers are limited and gubbed. Bookies record how much you bet on different sports and events and will build a profile of your account. Taking value prices, If you are consistently gaining an edge on the bookies via arb betting then you will quickly see your account limited. It is not hard for a bookmaker to compare the price you took with them vs odds at other bookies and Betfair. Also, they can check the prices you took against their SP. If you constantly back prices that go on to shorten you are not a profitable customer to them. Another flag when taking arbs is betting strange amounts to achieve an equal profit. If you were to bet on a value selection for $243.72, for example, it is going to increase your chance of a gubbing. 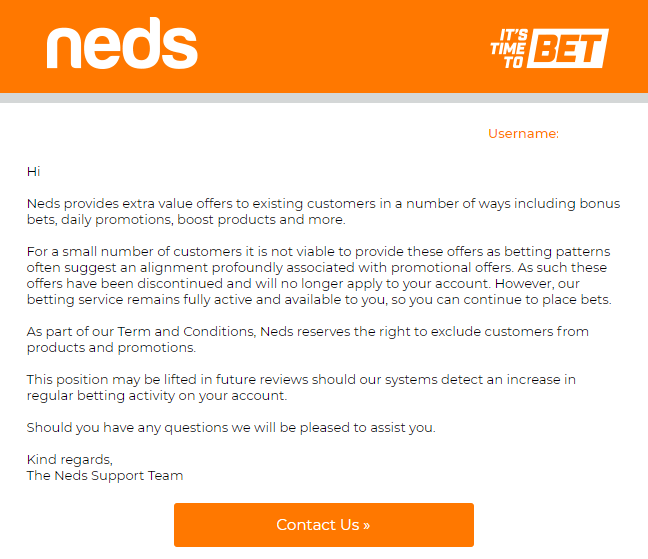 Another quick route to a promotion ban is betting over the automated limits of bookies when you are taking value. This bet will then get reviewed by the traders who are more than happy to set limits on your accounts and gub you from future promotions. Betting every promotion offer available: While matched betting relies on promotions to profit if you take every offer from a bookie and only place promotional bets you are likely to be gubbed more quickly. Placing a bet around a friend of a fellow matched bettor. If you have shared with a friend how to profit from matched betting you might think it a nice idea to spend a Saturday profiting from the horse and sports promotions together. If you jump on the same wifi and share an IP address bookies will link your account and likely ban both of you from promotions. At the end of the day, our member's experience is that bookies will gub anyone taking value. Be it through promotions, arbs or just smart punting. Take them for everything they're worth.